On a bright chilly Spring day, a fifty seater full of Rotarians and affiliates travelled to the Port, which is near Stanford le Hope in Essex. We went first to the head office, which is entirely appropriate for this state of the art facility, being apparently entirely constructed of green glass cubes. There we met Matt Abbott, Chief Communications officer, who proceeded to give us an excellent presentation - he told us he became interested in the project when he covered it for the local press, and his enthusiasm and interest were apparent from his obvious command of his subject and the way he dealt with the many questions that were raised. Then we went with Matt and his assistant in our own coach on a tour of the site. In all, the site covers 3 square miles of which 1 square mile covers the port and its facilities and the rest has mostly been devoted to environmental restitution - in particular 50 ponds have been built for the newts displaced by the works, along with special provision for adders (do they eat the newts? ), and a large area has been laid out as a tidal basin for young flatfish and the like. Construction started about 8 years ago, and is still proceeding. Two berths for the largest deep sea container ships have been completed and have been in operation for about 2 years, construction is advanced on a third, and ultimately there will be 6 in all. The berthside cranes for loading the ships are the tallest of their kind: they deposit containers on rows of stillages. 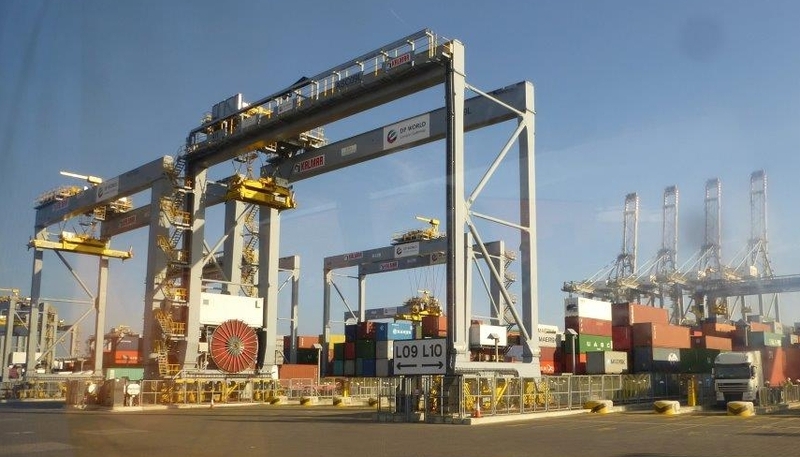 Shipping firms book appointments for their vehicles to collect loaded containers, and when they arrive at the port drivers are given tokens - when these are placed in special machines the appropriate crane automatically finds and lifts the relevant container and places it on the lorry. Apparently all the world's 18 million containers have unique numbers on them enabling the cranes to identify them. Seeing these driverless cranes moving about with containers is a little unnerving at first. There are very extensive railway sidings behind the area set aside for the ship loading, and special vehicles take to them containers intended for distribution by train, especially to the rail freight terminals in the Midlands. The theory behind the Port is that it will save a vast number of lorry miles. Hitherto, most containers have been taken by truck from the other ports to distribution centres in the Midlands, and a large number of these have been re-transported to the London area, where the greatest consumption is. Gateway enables journeys to the Midlands and back to be avoided. Furthermore, an enormous logistics park of warehouses is being built on the same site (we saw 2 of the new warehouses) to provide distribution facilities for broken down container loads. Sadly, the cranes are all imported from China - the largest ones travailing on huge barges - and there is very little export trade - most of the containers are returned empty to China or to South America. Currently, the port does not deal with European containers. The port employs about 470 people. It was originally conceived by P&O Ferries who saw that the oil refinery that formerly occupied the site was disused, and when that part of P&O was taken over by DP Ports, headquartered in Dubai and having port facilities all over the world, the project was taken on by the acquirer. Total cost was £1.2bn, all provided by DP from its own resources. We were told that in the last 2 months the operation has begun to move out of the red - and we felt DP must be brave investors, but already the port handles about 20% of deep sea containers coming to the UK. Traffic congestion, especially around the Dartford crossing and the A13 emphasised to us the importance of other infrastructure improvements to the success of this project and Matt referred to the proposed second Thames crossing. All in all, a very instructive trip.